On Jan. 20, Donald Trump will be sworn in as the 45th president of the United States and the Barack Obama era will officially come to an end. While his net worth is nowhere near that of his successor, Mr. Obama will leave office a very rich man. Based on a recent study by American University in Washington, D.C., the Obamas could stand to make as much as $242 million once leaving the White House. 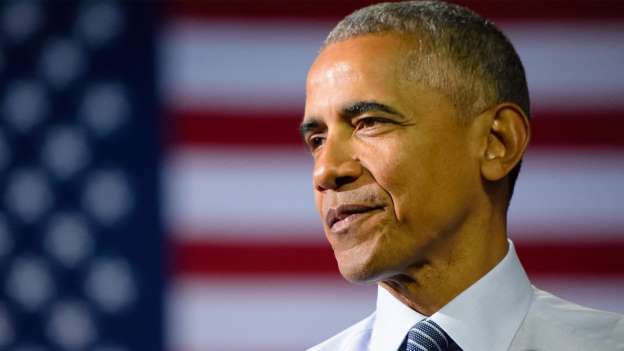 Here is a look at President Barack Obama as he turns over the presidency, his net worth and plans for the future. For his day job as president, Barack Obama earned $400,000 a year throughout his entire eight-year term — a salary that incoming president Trump has vowed to forgo. The president also receives a $50,000 annual expense account, a $100,000 nontaxable travel account and a $19,000 entertainment budget. On April 15, 2016, President Obama released his 2015 tax returns, which showed that he and First Lady Michelle Obama filed jointly and reported an adjusted gross income of $436,065. They paid $81,472 in taxes according to their 18.7 percent tax rate. They also donated a total of $64,066 to more than 30 charities. According to CelebrityNetWorth.com, Mr. Obama has a net worth of $12.2 million and First Lady Michelle Obama is not far behind with a net worth of $11.8 million. -2004: He earned a salary of $80,287 from the Illinois State Senate and $32,144 from the University of Chicago Law School, where he taught. The president also had assets in four financial funds worth between $50,000 and $100,000 each. -2005: Obama signed a multi-book deal with Random House and received a $1.9 million advance for “The Audacity of Hope,” plus royalties, following his appearance at the 2004 Democratic National Convention. Also that year he earned just over $847,000 off another book advance, plus $378,000 off additional book royalties. Meanwhile, his investments grew with the addition of a Nuveen Floating Rate Income Fund valued between $50,000 and $100,000. He also reported deposit accounts valued between $150,000 and $350,000. -2006: Obama reported book royalties of just under $150,000, plus $425,000 off an additional book advance. He also acquired publicly-traded assets worth tens of thousands, including funds with Goldman Sachs and Vanguard. -2007: Obama earned $3.3 million off book royalties from Random House and $816,000 from Dystel & Goderich Literary Management. He acquired a Northern Municipal Money Market Fund valued between $1 million and $5 million, in addition to U.S. Treasury notes valued between $500,000 and $1 million. For his daughters, he invested in two 529 college savings plans valued around $200,000 each. -2008: When Obama was selected as president, he owned somewhere between $1 million and $5.1 million in U.S. Treasury bills. -2009: Obama won the Nobel Peace Prize, which came with a $1.4 million award. He donated it to an assortment of charities. -2009-2015: Obama earned $400,000 a year as president and continued to earn book royalties, as well as interest on his investments. The president is likely to return to his community activist roots — following his slumber, of course, according to USA Today. That will likely include work on issues that were important to him during his presidency, such as gun control, immigration, nuclear nonproliferation, race relations and criminal justice reform. According to the 1958 Former Presidents Act, Obama will receive the salary of a Cabinet secretary for the rest of his life. Currently, that’s $205,700 a year. Among the other perks are health insurance and round-the-clock Secret Service protection until his death. The costs of Secret Service protection are not made public, but Obama will also receive funds for an office, staff and related expenses, which George W. Bush took advantage of to the tune of $1.1 million in 2015. Many presidents establish foundations and enjoy lucrative second careers as in-demand speakers and authors. Although there is no hard data on Obama’s previous speaking fees, past presidents such as George W. Bush have earned between $100,000 and $175,000 per engagement after they left the White House. First off, money talks. According to CNN, former President Bill Clinton and his wife Hillary earned an average of $210,795 per speech in the 15 or so years since he left office. That totals approximately $153 million for 729 paid speaking engagements. American University estimates that the Obamas could make as many as 50 speeches a year once he is out of office, earning “a conservative $200,000 apiece and you’re already close to $200 million before taxes,” the study found. Mr. Obama has already proven to be an accomplished and popular author. Following the presidency, experts predict that he could earn about $30 million for his memoir, while Michelle Obama could garner an estimated $10 million for hers, according to the New York Times. Either way, Obama will be the first president in nearly 100 years to remain in Washington, D.C., after leaving office. He and the family will remain in town so his youngest daughter, Sasha, can finish high school. Their new Washington digs are located in the capitol’s posh Kalorama neighborhood, where first daughter Ivanka Trump also owns a home. The Obamas have leased an 8,200-square-foot, nine-bedroom mansion that was built in 1928. The spacious home last sold for $5.3 million in 2014 and is estimated to be worth $6.3 million today. Barack Obama will leave office a very rich man. He and the first lady are likely to remain a visible Washington power couple after an even wealthier power broker takes his place in the Oval Office.